Two big name pitching prospects took the mound and shined for their respective new teams on Wednesday night as this year's top draft pick Aaron Nola and 2010 first round selection Jesse Biddle looked strong and notched wins. 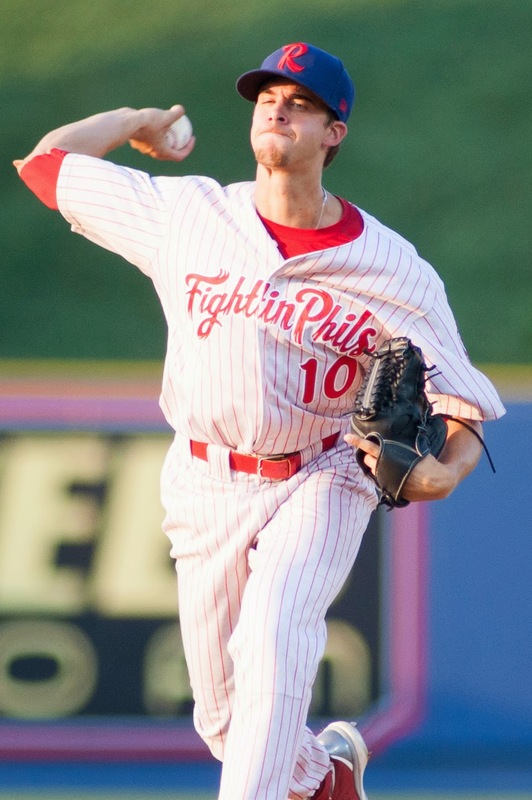 Nola, who was selected by the Phillies with the 7th overall pick in June's MLB amateur draft, made his Double-A debut with the Reading Fightins, going five innings, allowing one earned run on six hits while striking out four and walking one to down New Britain. First baseman Jake Fox carried the Reading offense with his team leading 16th home run and four RBI. In eight pro games, Nola sports a 3-3 record with a 2.97 ERA while striking out 34 and walking six in 36 1/3 innings. Biddle, who entered this season widely regarded as the Phils' top pitching prospect, tossed five no-hit innings for the Class A Advanced Clearwater Threshers to earn a win. He struck out five and allowed just one base runner, a walk. The 22-year-old lefty returned to action for the first time since July 26th, when he made his first appearance in more than a month for the rookie level Gulf Coast League Phillies after being sidelined for a reported mental break. Biddle, a Philadelphia native, was 3-9 with a 5.03 ERA in 15 games started for Reading earlier this season. Clearwater first baseman Art Charles slugged his club's team-leading 13 homer and drove in two runs to pace the offense toward a win over the Daytona Cubs. The Threshers (20-26 in the 2nd half) are in fifth place in the Florida State League's North Division, 7.5 games out of first place. The victory for the Fightins, in front of 7,202 fans at Reading's FirstEnergy Stadium, was their 50th of the season. The team is still firmly locked into last place in the Eastern League's Eastern Division, 19.5 games off pace for a playoff spot. Both pitchers were on an innings cap for the night. Nola will likely stick by an 80 pitch/five innings max per outings going forward this season, while Biddle's workload may increase a bit as he is stretched out.